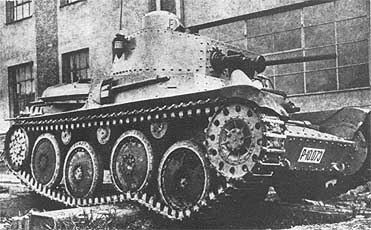 The CKD/Praga LT-H Light Tank was developed by Czech Firm CKD during the 1930’s as a private venture. It was exported to Peru and Switzerland where it was manufactured under licence with a Swiss made 24mm Oerlikon cannon under the designation Panzer 39. Latvia has also ordered the vehicle with a 20mm cannon, however when German invaded Czechoslovakia, these vehicles were sent to Slovakia. The LT-H was further developed by Czech Firm CKD into the LT-38 medium tank, which served as the PzKpfw 38(t) in the German Army.